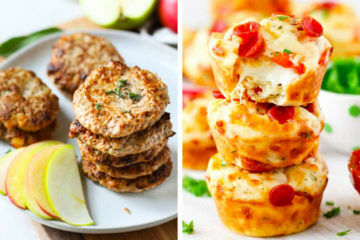 Want to avoid last year’s pattern of half-heartedly half-eaten sandwiches coming home again at the end of the day? 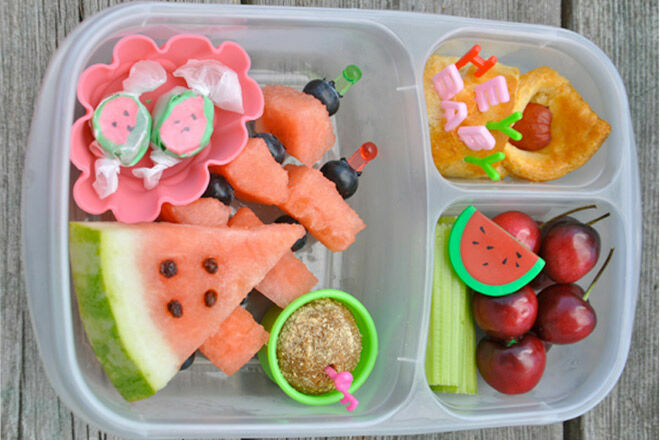 Here are some cute ideas to dazzle the kids when they open up their lunchbox. Once they have seen these tasty treats, they’ll be excited to eat a cloud, a boat and some sunshine. 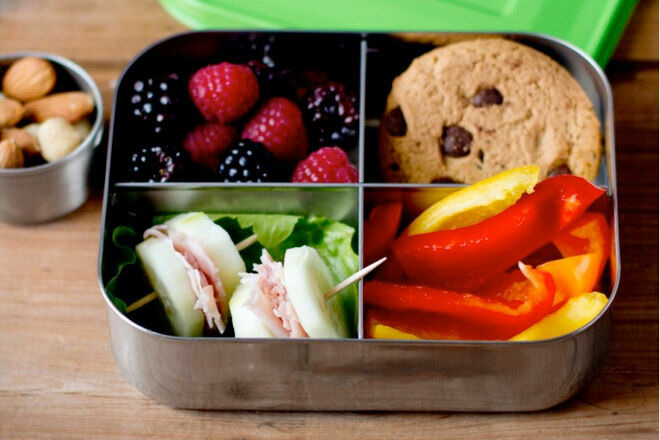 These are some ideas to get you started, but once you begin the bento, you’ll be surprised how creative you can be. 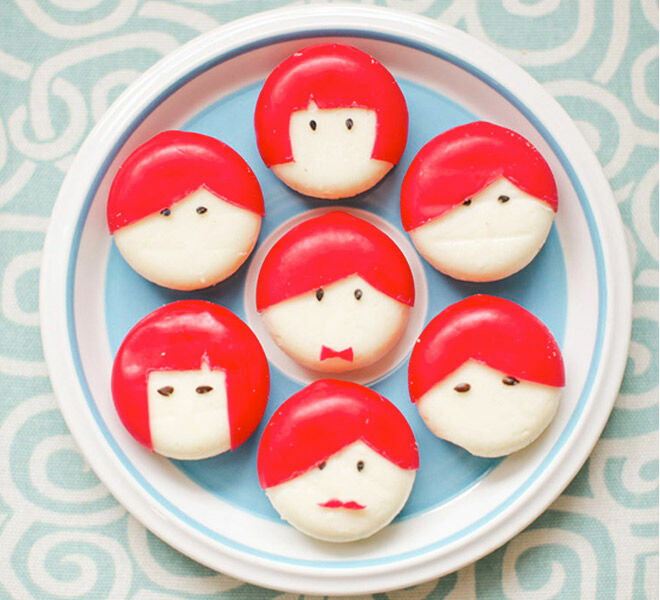 Since it isn’t too tricky or time-consuming, this gorgeous idea from Cute Food for Kids is a great one to try out first. The apple can be done with a knife or a peeler and decorative toothpicks add an extra touch. 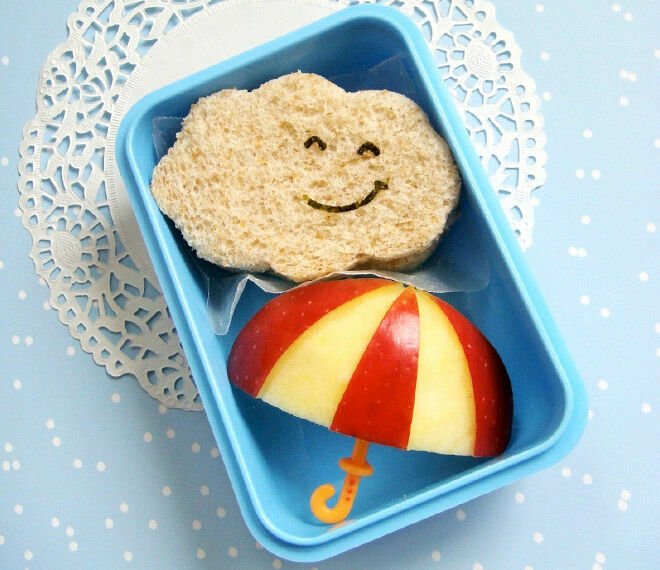 Finish off the lunch with a cute cloud-shaped sandwich and the kids will gobble them up. 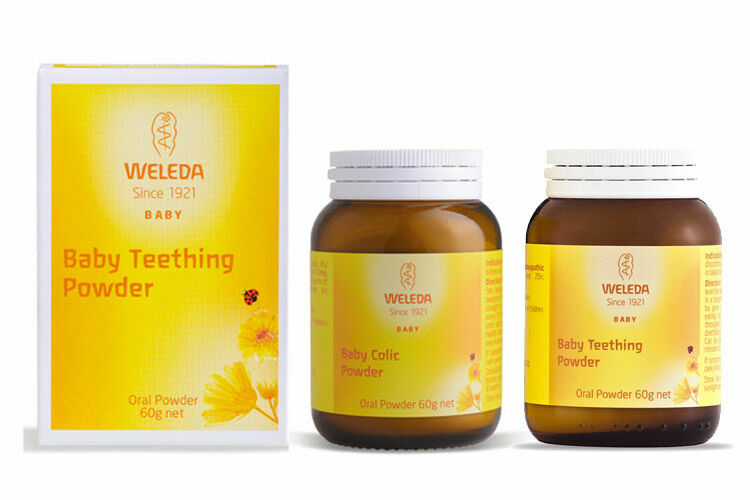 It’s the perfect way to cheer your little one up on a rainy day. 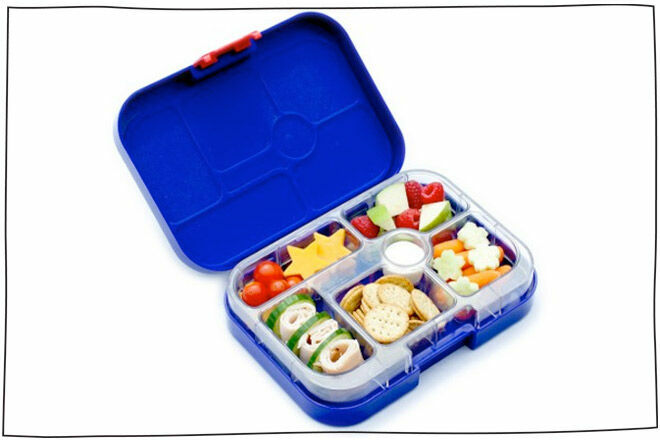 From PBS Parents this is another good one for the newbie bento-maker. 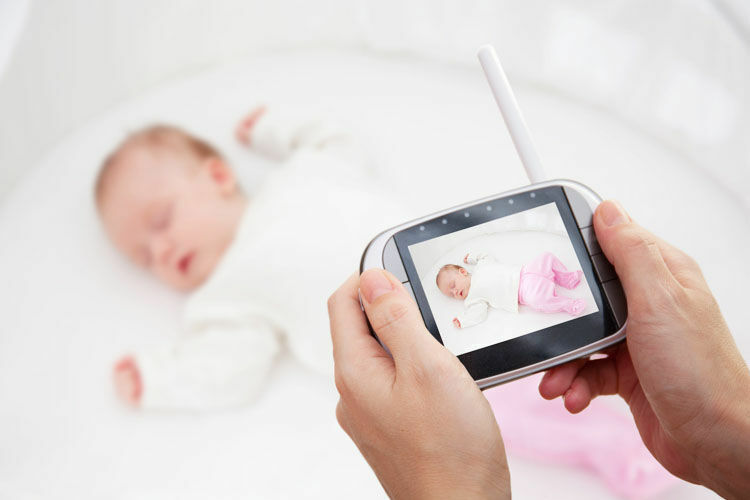 There’s no extensive preparation, just a little thought about presentation. 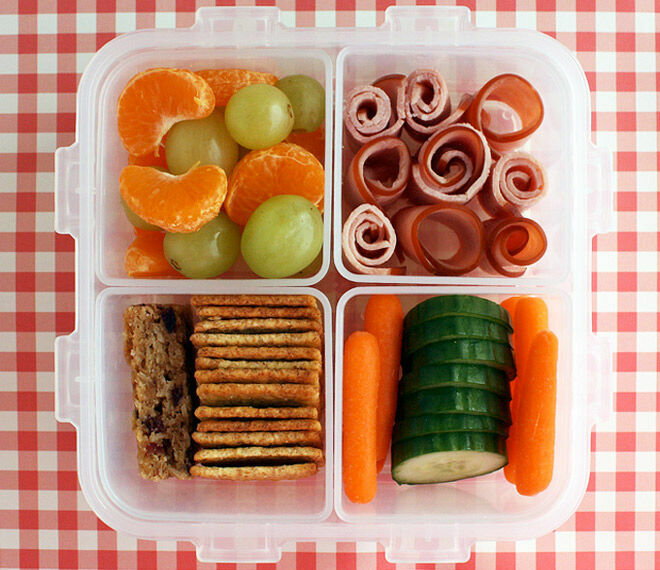 Ham roll-ups are always a hit and neatly lined up veggies will appeal to kids who like things in order. Sometimes all you need is a cookie cutter and a vivid imagination. 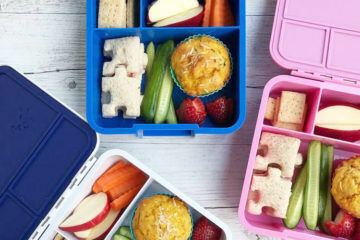 This can be enough to give your bento a theme that will interest the kids in the actual food, and have them excited about lunches for the entire week ahead. 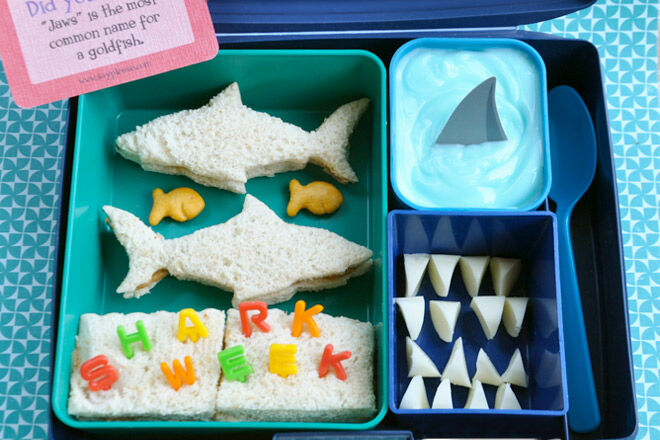 Bent on Better Lunches shows us how to get our teeth stuck into shark week themed lunches. A simple bento that doesn’t take long to prepare. 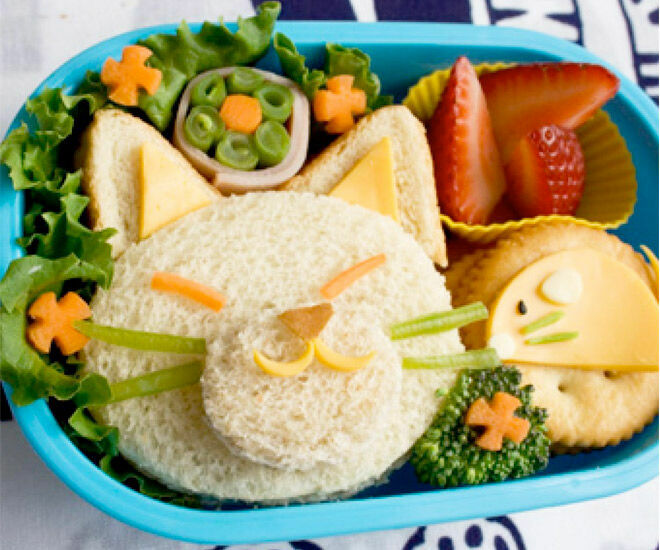 This is just a slight variation on a sandwich, cheese and crackers but the cute factor will have them distracted. 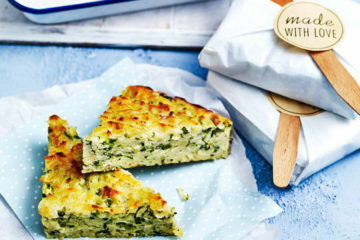 Shaped cheese and finely cut celery complete this friendly feline feast. Real sushi probably won’t survive until lunchtime but Another Lunch show us a great alternative. 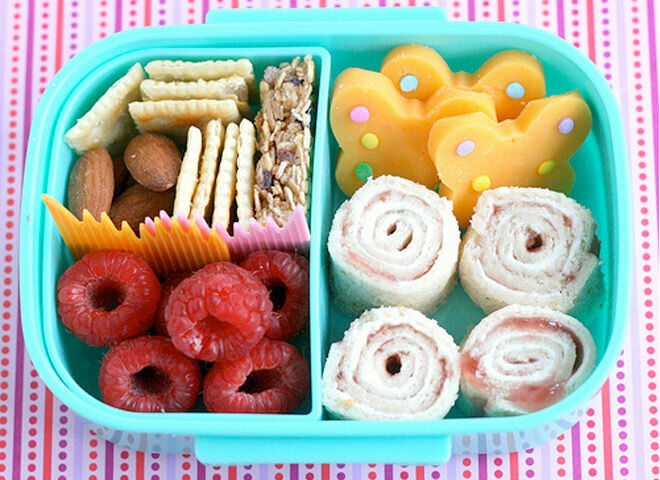 Little sandwiches filled with ham, cheese or any other favourites can be roll-up to form mini rolls for your mini-me. 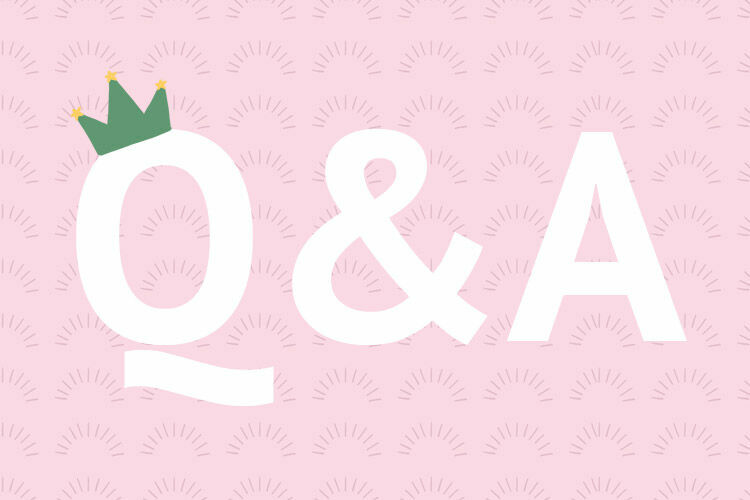 Check out this great tutorial from Ellen Aguan to help get you started! We couldn’t resist this one! 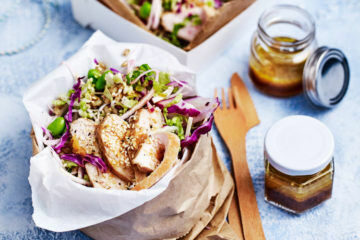 It’s more of an addition to a bento than a bento itself, but we love it all the same. All kids like Babybel but getting that pesky red wax off can be a task in itself. Now you can give them a hand as well as a surprise friend in their lunchbox. Thanks 100 Layer Cake-let! One of our favourite books for kids. Bento Monsters have done a great job of re-creating The Giving Tree by using a sandwich and lettuce leaves to set the scene. Thankfully, it’s easier to make than it looks. It’s also a great way to introduce a beautiful new book and open up meaningful discussions in a way that younger ones can relate to. 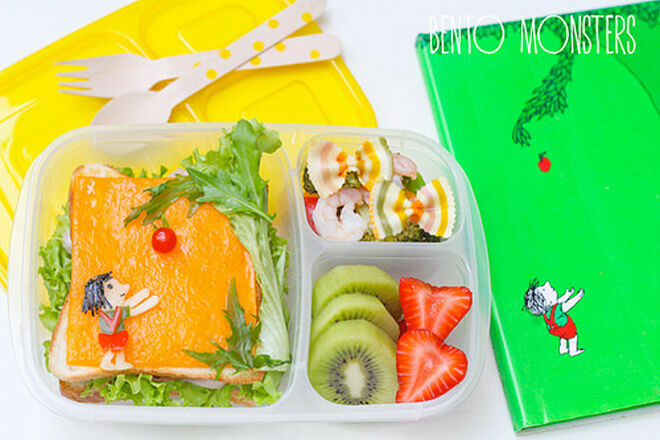 Mandarin segments become rays of sunshine and cut apples turn into stars inside this heavenly bento from Frog Prince Paperie. With sandwiches shaped like crescent moons, they’ll soon be making constellations out of their blueberries. From a cucumber starfish to a cheese and orange sail boat, it’s amazing the things you can create with fruit and cheese! 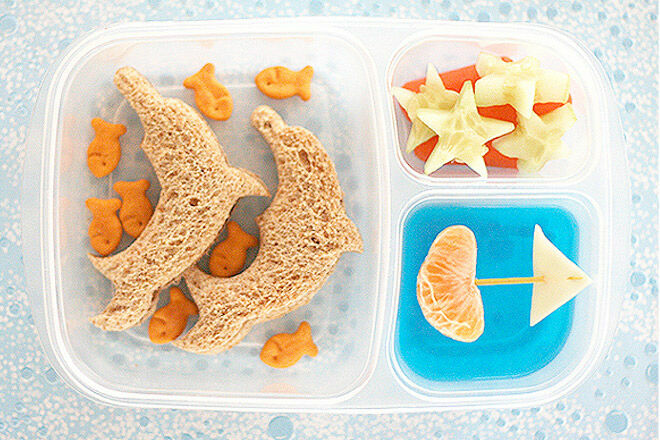 Clever mummy Lisa even set a small amount of blue jelly in her kiddies lunchbox the night before to make an ocean. Now that’s what we call dedication! 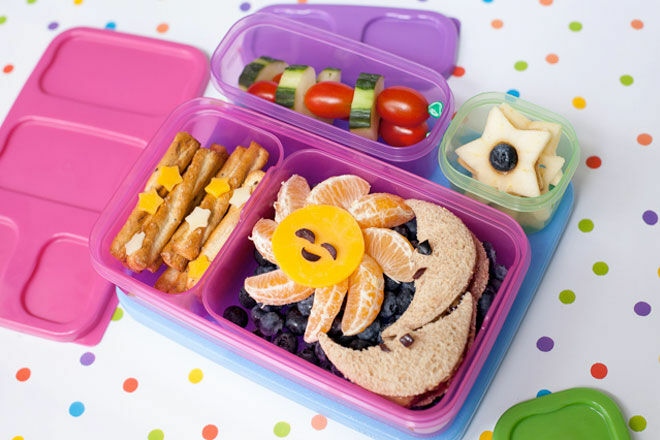 Alpha Mom shows us how flowers and neatly piled veggie sticks can make all the difference with this super cute spring inspired bento. 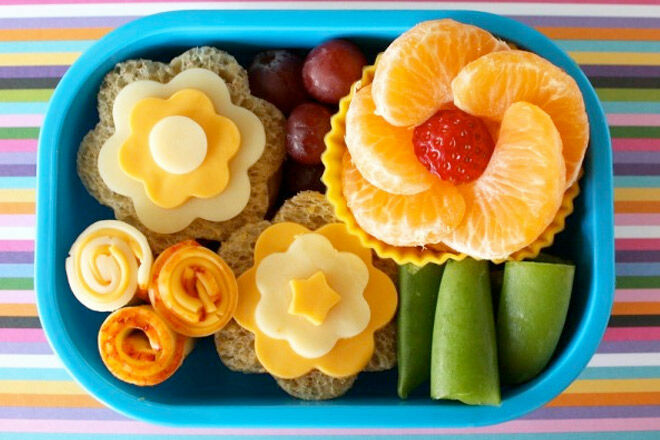 Juicy mandarin slices become scented flower petals and rolled-up meat and cheese make a delicious bento extra. There’s no dancing in this lunchbox, just some juicy watermelon and other delicious summer fruit. Bent on Better Lunches uses cookie dough for sand, tiny chocolate rocks for effect, and a ‘baby in a blanket’ (not in a corner). Lunchbots: With a slightly more sophisticated stainless-steel look, Lunchbots lunchboxes (from $17.09) will suit even the older kids in the household. 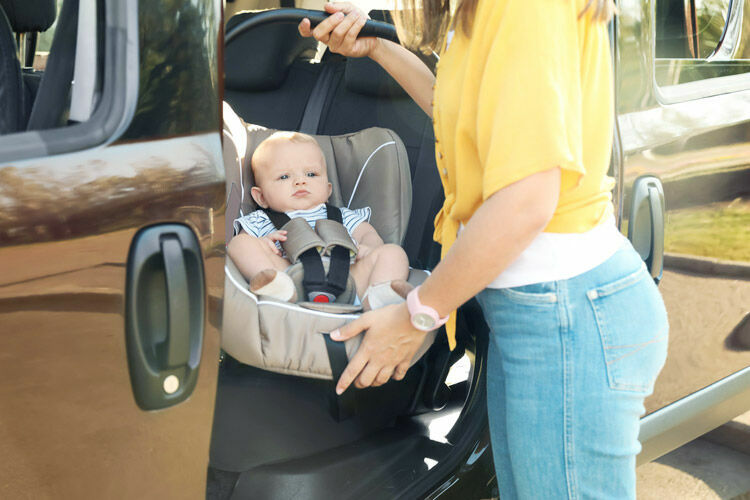 Four compartments hold enough for even the hungriest of children. GOODBYN HERO ($24.95): Goodbyn Hero’s offers clean lines and easy-to-use convenience. With three or five compartments, it also comes with inner lids for securing dips or other potentially messy snacks. A variety of colours means there is a Hero for everyone. 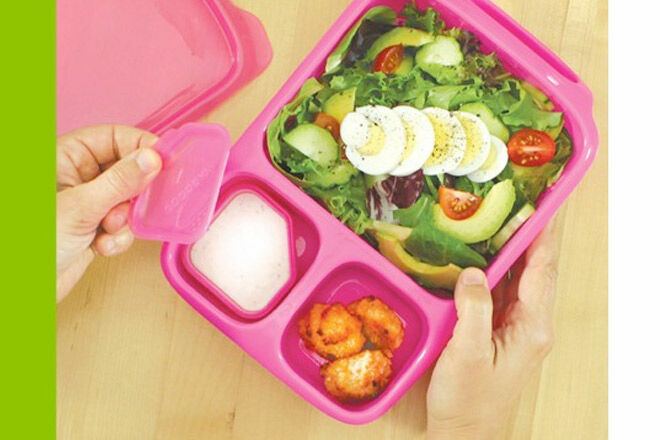 Yumbox ($34.95) is great for kids whose lunchboxes turn multiple somersaults in their school bag. It has a leak-proof lid, and five compartments for filling with foodie treasures. It comes in blue and purple. Too, too cute! 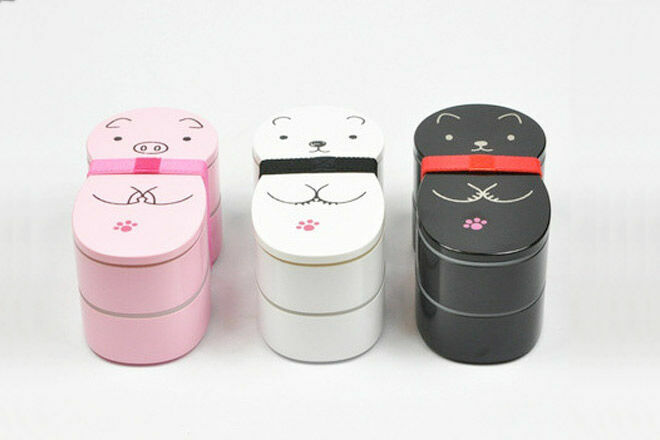 These gorgeous animal doll bentos ($24.50) from Bento & Co come in a pink piglet, a white bear cub and a black kitten. 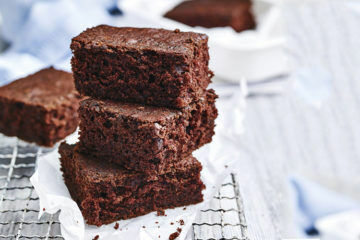 Each has two layers for stacking delicious treats, and comes with inner lids and a band to hold it together.